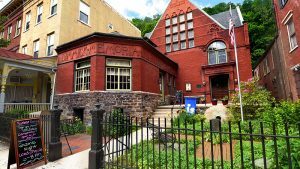 The Jim Thorpe Earth Day Festival was started in 1997 by a group of like minded individuals who not only share a love for music and art but also a love for their environment. The Festival is based in beautiful Jim Thorpe, Pennsylvania, where we are surrounded by mountains, streams and the Lehigh River. Now a non-profit organization, the Jim Thorpe Earth Day Festival aims to create a fun festival for the community while educating and promoting environmental awareness among local residents and tourists alike.The JTEDF consists of a Lehigh River Cleanup, Free Live Music in the Josiah White Park, Dimmick Memorial Library & Horizons, Crafts, Basket Raffle, Kids Recycled Craft Area, & Hooping, Face Painting, Workshops, Environmental Information, Bounce House, Good Food, Good Vibes, and FREE to the Public! !